In my opinion, Ignite was perfect for what I wanted and needed (yes, those are two different things). My current role is as a SharePoint developer/designer/no-code solution resource for my company. I’m the type of person who deals directly with the business, translates their needs into solutions without them having to be technical experts, and answers the questions they have on a daily basis. I needed this conference to both teach me new things and connect me with people who do that same type of work. I got a lot of that all week long, and I have a lot of new material to sort through and new things to learn. However, there was something much more important that happened. Between sessions, talking with colleagues, and brainstorming with Sandra Mahan (aka my SharePointBuddy), I now understand that Office 365/SharePoint 2013/SharePoint 2016 isn’t simply a technology choice or decision. Watching what Graph/Delve does to connect people with information (findability and discoverability) really does change the way that people can do their jobs and leverage what they know. I was a big believer in what Notes/Domino could do for an organization. I did the whole evangelist “Lotus is good/Microsoft is evil” thing. But as my technical world started to change focus to SharePoint, I shifted to more of a view of “it’s just technology to build solutions.” I don’t get into detailed arguments over what is right and wrong with technology X. I just focus on what I *can* do with it (mostly out of the box) and what I can do for my business customers. This has served me well for a (very long) number of years, and it’s certainly less stressful. The bad side of that shift was that I lost that “something special” that I used to have. I’m still good at what I do, but I tend to react and do instead of thinking ahead and leading. I get too bogged down in being busy (and productive) instead of being effective and leading. I stepped away from the IBM/Lotus community where I wrote, blogged, spoke, and co-authored. The problem is… I really enjoyed that. I enjoyed helping people, being on stage, knowing who was who and who did what. I loved traveling to conferences (often on my own dime) and presenting in user group settings that changed the way our community viewed tech conferences. I got a lot of personal satisfaction helping others take their first step in the conference community, co-presenting with them when they first stepped on stage, and then watching them go on to speak internationally. This week at Ignite has “re-ignited” that passion that’s been buried for far too long (sorry, I had to use that pun). Microsoft has a vision for the workplace that makes sense to me, and they’re doing things that are coming together nicely. I’m excited to see how this plays out, and there is plenty of opportunity at my place of work to make incredible things happen. I meet the people who are part of this community, and I’m excited to be part of that. I want to start pushing myself again, and passing along those things to others. And to top it off, I get to work with incredibly talented people on a daily basis, and we are going to make some awesome stuff happen. It’s time for that to play out again, starting now. I have a really bad habit of “collecting” links to really interesting articles tweets, emails, and other stuff I want to read for my professional life. But unfortunately, I find it far too easy to get behind in the list, and pretty soon, it’s just a collection of things I’ve never read. Taking a tip from Sandra Mahan, I’ve started putting the links into daily reading pages with To Do tags. The goal is to spend time reading at least five articles a day (I have to read a bit more than that to clean up my lists). As I cover my items and check them off, I not only keep myself more current on the latest SharePoint news, but I also have a history of things I’ve read if I ever want to track them down later for reference. 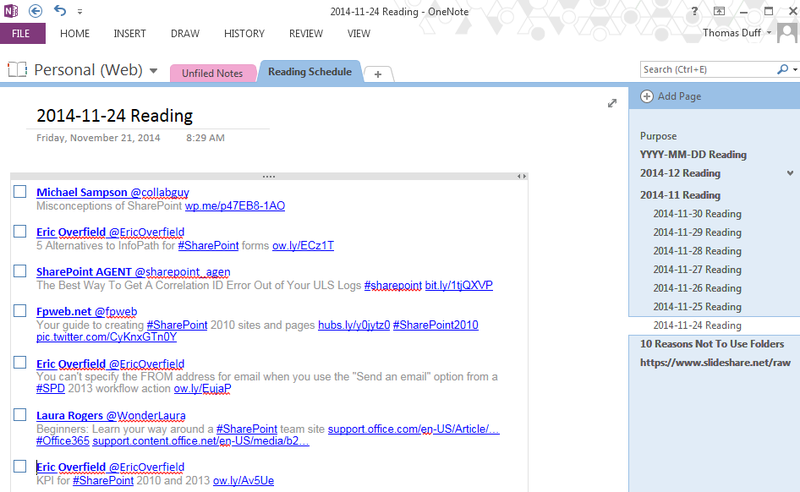 Today I got my Twitter Favorites/To Read list transferred over to OneNote pages. I’m working on email newsletters, and I also have to clean out my Pocket saves that are work-related. There are a number of SlideShare.net entries that need to make it out there also. What I like about this method (in addition to the tracking and responsibility that’s built-in) is that I can have this list anywhere I go. It’s on my home computer, on my iPhone/iPad, and my work machine. Whenever I have a few moments, I can pick off one or two reading items and I know that will be updated throughout all my devices. This historic move integrates two of the oldest and most respected educational companies in the SharePoint space under the same leadership. Post acquisition, both companies will continue to operate as independent business units, with Combined Knowledge specializing in UK opportunities and Mindsharp continuing to focus on accounts in North America.”Our customers are not looking for traditional training providers; they need highly specialized, global partners who understand real business challenges and who can build custom educational programs and roadmaps based on the individual needs of a business,” states Steve Smith, CEO of Combined Knowledge. “With this acquisition, we now combine the North American reach and brand recognition of Mindsharp with the products, services, and training courseware from Combined Knowledge in the UK to provide an end-to-end education and adoption solution for customers on both continents. Combined Knowledge and Mindsharp training offerings and support services lead the industry in SharePoint educational content and are available worldwide via training partners and resellers, including Microsoft Gold Certified partners. Have fun AND learn SharePoint stuffs? Join us at SharePointalooza in Branson, MO September 12th and 13! SharePointalooza is less than two months away! SharePointalooza is a TWO DAY conference offering sessions and technical workshops on all things SharePoint, Office 365, and Yammer. SharePointalozza takes place at Branson Landing in Branson, Missouri on September 12th and 13th. Please allow us to take a few minutes to explain to you why you should consider attending SharePointalooza. OUR SPEAKERS – We are truly blessed to be hosting the greatest experts in SharePoint. You will not find a more world class list of speakers anywhere else. These awesome SharePoint MVP’s and talented speakers from all over the world are coming down to support the community and have a great time. We cannot stress enough how much we’re truly humbled by their experience and skill. This alone sets SharePointalooza apart. WORKSHOPS– In addition to standard sessions we also offer more in-depth workshops that you will simply not find at other conferences. LOCATION, LOCATION, LOCATION – The event is being held at a great location in Branson at a world class convention center. Directly across the street is Branson Landing which boasts of many shops and restaurants. LIVE MUSIC – We’ve found some amazing bands from Chicago and Nashville and we are bringing them in to play on an awesome outdoor stage at night to give the attendees and speakers a chance to unwind after a day of learning. SUPPORT – By attending SharePointalooza you are supporting efforts to continue to bring high quality technical conferences to the area. Without your attendance and support these events are not possible. Registration is open! Register today at http://sharepointalooza.eventbrite.com and we’ll see you soon! 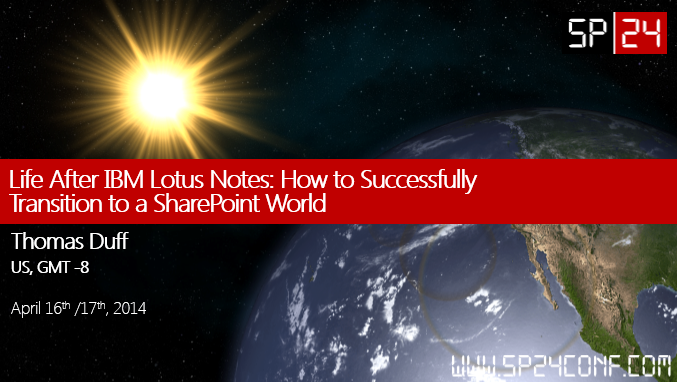 My SP24 session – Life After IBM Lotus Notes – How To Successfully Transition To A SharePoint World. First off, thank you to the organizers of SP24 for pulling off an incredible event (and for allowing me to speak at it!) The platform and combination of technologies used to bring this together was impressive, and I know you all went a long way past “above and beyond” to make this happen. Thank you. I presented a session titled Life After IBM Lotus Notes – How To Successfully Transition To A SharePoint World. It was a story of what I went through with our company’s migration from IBM Lotus Notes and Domino to Microsoft SharePoint. It was meant to help those facing the same type of situation (and there are a number that have/are doing just that), and to share some of the things I learned in hopes of saving people a few scrapes and bruises (or worse) along the way. helped contribute to the overall session. In the following paragraphs, I’m going to use the word “Notes” to mean “IBM Lotus Notes and IBM Lotus Domino” (or whatever the latest legal branding name happens to be). If you see the word “Notes”, assume I mean all the stuff associated with Notes/Domino. In 1997, I attended my first Lotusphere after having worked with the software for less than six months. I sat in the opening general session with a “deer in the headlights” look, what with the music, lasers, smoke machines, and so forth. I came away from that event with a decision and vow that Notes was going to be the thing I became really good at. No more just “touching the surface” of what things like Cobol and Eztrieve could do. Fast forward to now, and I look back and say I probably got to that point for myself and what I hoped for. I was never the sharpest technical tool in the drawer, but I could share, help others, talk on stage, write articles and books, and make customers happy with applications we wrote for them. I was a “Notes Evangelist” in the truest sense of the word, and was emotionally “all in” when it came to the “Notes Is Good, Microsoft Is Evil” arguments. Given all that, you could reasonably expect that when it came time to start implementing Microsoft technology to replace Lotus in our company, I was devastated. It’s taken me a number of years since 2009 (*way* too many) to finally switch my mindset and dump the baggage accumulated over the last 20 years. I’ll set aside the argument about “is Notes dead?” for some other time. What I *will* say is that technology is a tool to solve business issues. You don’t buy a wrench and practice wrench-fu to say you can fix anything and build everything with a wrench. You have a wrench to use as a tool to build something useful. You will have your favorite wrench, and some wrenches might be better to use in certain situations. But when you get done, you don’t look at a house or a car and say “wow, that was some master guru level wrench work there.” Instead, you hop in the car or go in the house and USE IT. Now I can (better) look at Notes and SharePoint as tools to build business solutions. Each one has things they do better and worse than the other, and it may be that your particular situation dictates that you will use mostly wrenches instead of that nail gun that you think might be better or faster. Regardless, learn how to use the tools that make sense for your project, become good at them, and don’t get all caught up in arguing about tools. While you’re arguing over bradawls and stitching awls, someone will come by with a power drill and finish the job while you weren’t looking. The Notes community was (and still is) one of the most incredible tech communities I’ve ever been part of. I have friends all over the world that I’ve worked with, spoken with, wrote with, debugged with, and gotten various levels of shattered with. You may only see each other once a year at a conference, but it’s as if you never left when you pick up where you left off. I’ve spent hours in a hotel buffet-type restaurant, listening to and crying with a friend going through a hard time in their life. Technology is secondary in those situations, and in fact will probably go away at some point. But those moments are the ones that remain forever, and that make all the difference in the world. Moving away from Notes scared me, as I thought I would lose all that. We all thought that the “Yellow Bubble” was something that no other technology user community could experience. their work, just as accessible to others, and have just as much fun when you put them together at some event. Granted, you don’t get to go from “rock star” status in one community to “rock star” status in the other just because you got there once before. You don’t get to be a “name” when it comes to speaking until you work your way back up to that level and prove yourself once again. But if you come into the SharePoint community with the same mindset that you did for your Notes community involvement (I’m assuming you weren’t a jerk in the Notes community), you’ll find it’s just a matter of time before you don’t even notice the difference. Leaving Notes is not the end of your world (unless you want it to be). It’s the people, not the technology. Starting SharePoint is the beginning of a whole new world, and I’ll venture to say that from a community perspective, you’ll feel very much at home. Back when Microsoft and vendors were pushing people hard to migrate from Notes, the common set of statistics about Notes apps were: 60% of your applications are unused, 20% are pure template-based applications, and the rest are custom applications that need to be analyzed for migration. I *hated* that set of stats, as I *knew* my environment better than that, and I *knew* we used most all our applications! Except that when we finished the analysis, we fell pretty much into that same pattern. The main point to remember is that “I think” is trumped by “the analysis of our environment shows”. This is especially true if your application environment is large, it’s been in place for a long time, and you didn’t touch everything from day one. Your numbers might be the same, or they may be entirely different. But just make sure you take the time to do the impartial analysis to separate emotion/perception from reality. My experience says that people like to talk about governance of Notes or SharePoint environments, but no one wants to spend the time, effort, or resources to keep it going day in and day out. We didn’t have good governance in place for Notes for many reasons, one of which was the decentralized nature of Notes application development. Expect that you’re going to find some really bizarre stuff in your Notes environment when you start to analyze it. Don’t beat yourself or others up for the lack of documentation or controls. That was life, it’s done, and now you move forward. The best use of your time is figuring out what lessons you can learn from that, and then work on putting something better in place for your SharePoint controls. It’s still not going to be fun or easy, but you have the chance to start with a relatively clean page again. When we got the application analysis back from the vendor, the numbers were even more overwhelming than what they ended up being. 10000+ applications, hundreds of gigabytes of data, etc. This is where your knowledge of the environment comes into play, however. *completely* overstated. We rationalized our application down to 2200+ unique databases, and that’s the list we used to manage the effort over the next five years. It’s still a lot of databases, but you’re not being charged for or having discussions about inflated work totals. One of the chat comments about the amount of time it takes to migrate an application was “3x as long as it would take if I’d do it in Notes, and then hope to really deliver it 1.5 – 2x longer than notes, but still before I said it would be done.” I find this painfully true. There are migration horror stories of companies spending millions to move a Notes application to something else, and 12 to 24 months later it’s still on Notes with no idea of when it will be moved. that. It’s unfair to compare the amount of time it might take to develop an application in Notes and SharePoint unless you have expert developers in both. It’s likely your SharePoint developers are not yet experts, so don’t expect miracles. Do I Need Migration Software? Back when we looked at migration software, the main vendors were Casahl, Quest, and Binary Tree. They would offer a tool to analyze your environment (relatively inexpensive), and then they’d hope to use that information to help you migrate. you’ll have some level of manual effort to migrate… there’s no other way around it. I *strongly* suggest you use one of the analysis tools to look at your environment from a non-emotional perspective. Once you have those numbers, you can figure out the best way to move forward based on your budget and needs. But don’t accept any “we can have your environment migrated in just a few months” statements. It doesn’t work that way. 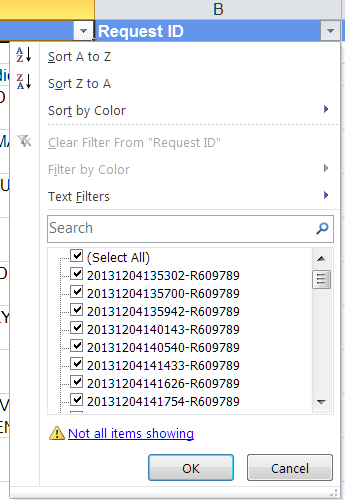 My recommendation in those cases is to set up some hidden views to look at all documents by created or modified date. In some cases, it may well be a “take your best guess” to figure out how much/little the site is being used. My archiving/obsoleting/”ask forgiveness vs. permission” technique helped me pull that off in nearly all cases. Migrating Notes applications to SharePoint with a mind towards mobile access wasn’t a “thing” when we were doing this starting in 2009. I’m going to contend that a Notes migration to SharePoint doesn’t, in and of itself, have anything to do with mobile. Here’s my point… If you’re going to try and make the case that it’s easy to mobilize Notes applications with vendor tools or XPages, you are probably still fighting to keep your company from moving away from Notes (or you’re trying to sell a tool to mobilize Notes applications). I’m working from the point in time where the decision has been made that you *will* be moving away from Notes. If you can convince your company otherwise, rock on! The other argument is that your new SharePoint applications should be mobile-ready vs. the old Notes application. *THAT* is correct. However, that’s a decision you’ll need to make on an application-by-application basis, not at the level of “we’re moving away from Notes”. Most all of your SharePoint applications are going to run in a web browser, so that’s already one-up on Notes client applications. How well they work on (or even *if* they need to work on) mobile devices is a decision you should make as part of your application analysis when you’re moving a Notes database to a SharePoint site. One question that came up was about how functional and easy it is to get “out of the box” functionality in SharePoint. At least the way I read the question, it sounded like it was from a viewpoint of what it took to develop a SharePoint application (probably as compared to a Notes application). My statement about having an abundance of out-of-the-box functionality was based more on the ability to create quick no-code solutions without having an IT geek on hand. 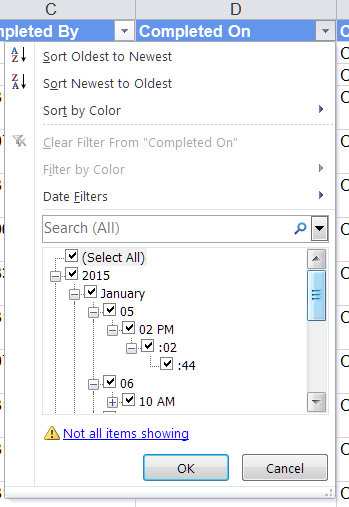 In addition, there’s a lot of things that you can do between Office applications (like export a SharePoint list to Excel) with simple menu options. Most of those features are truly “out of the box” for the business. It does take work to set other features up, like some business intelligence features, data connectors, etc. But that would take time and effort to set up in either environment. Can We Shut Down Notes Now? This might have been my biggest frustration… It was (and still is to a much smaller degree) extremely difficult to get people to understand the difference between “the migration is done” and “we’re turning off the Notes servers”. Migration Or Site Templates To Beg/Borrow/Steal? I would suggest going to codeplex.com, which is Microsoft’s open-source software site for community contributions. That’s where you’ll find some great things that others have shared. Training is important, and the larger the company the harder it is. Part of the reason people “hate Notes” seems to be because they don’t know how to use it at an optimal level. If you don’t train people on how to use SharePoint, you’ll hear the same complaint. The problem is that everyone learns differently. Some people are visual learners, some need to be hands-on. Some need a classroom environment, others are OK with a book or web page. And we need to face it… some people just don’t care and won’t learn regardless of what you do. Bottom line… factor in training to your migration to help mitigate the “I hate…” syndrome. What’s Cheaper: Notes Or SharePoint? can continue to use the Notes/Domino software at the level you’re at for as long as you want for no cost… if you choose not to renew your maintenance agreement. You can’t upgrade, you can’t call in for support, etc. But you can use it forever as-is. I know people who are still using version 5 of Notes/Domino. In that situation, it costs you “nothing” to run a Notes/Domino environment if you’re not doing much with it. If you’re only running a single Domino server to allow people to see archived content if needed, then you really don’t need maintenance (in my opinion). If your company is very risk-adverse, they may choose to pay the maintenance costs (and I’m sure IBM will thank you). But if you want to assume some level of risk (and I’ll maintain it can be pretty low), the price becomes pretty cheap.